Up above me sits my modest collection of parenting books which are nestled next to my books about California civil procedure (i.e. litigation). Both basically deal with the same thing – how to address challenging moves. When I glance above at the books I have a new perspective. I’m not sure why, but maybe it’s the five years of mommy hood, observing trials and tribulations with my own boys and those of my friends. The reason doesn’t matter – but here is the thing. All parenting books are basically the same. Just think about it. Using the books on my shelf as an example there is the book on positive discipline, touchpoints on emotional development, and healthy sleep happy child. Each of these books have one thing in common. They tout one particular theory and give examples of how to implement it. These examples seem good in theory. For example, calmly telling the escaping toddler to come back and using positive reinforcement to encourage results. But what happens when the toddler is running towards oncoming traffic? Will calmness work then? Not for me. Then what are these books? I think they are ideals. They set forth paradigms to think about parenting, strategies for dealing with different behaviors. This has to be checked against the reality that no single theory will work all the time, nor should it. We are complex beings. Even typing this makes me question my thought – as these are the books professed by experts to raise happy and healthy kids. Like there is some sort of recipe – 50 positive affirmations + 0 timeouts = happy child. But there is no recipe for successful parenting as each child is different. We live in a culture where everyone has an answer to something. Hell, even before our children are born, we read books that tell us what to expect. They give detailed pictures, diagrams, charts (ya da ya da), to try and explain the unexplainable. When I first read those books, I did gain some sort of comfort. But now looking back, I wonder what they really added. Those precious hours spent studying different books, parenting philosophies and even educational philosophies, could have been spent just enjoying the then present moment of pregnancy. This outward direction ensues beyond pregnancy and into parenting. Maybe it’s technology, the internet or fear of duplicating the mistakes of our own parents. Everything directs parents outside of themselves to seek external answers – in books, on the internet or experts. I’m not saying that all expert opinions are bad as I have gotten wonderful advice from behavioralists and professionals. What I am saying is that we ourselves are our own experts. And sometimes our instincts provide answers. Take the birth of my second son for example. The nurse nearly sent me home 45 minutes before he was born. She was convinced I wasn’t in labor. If that was the case, then I guess C’s labor was some sort of record. Sure birth and parenting are two different things, but both give reason to trust ourselves. We know what’s best for our kids. On an instinctual level we can read their smiles and body language. Sometimes we can understand what they are experiencing without them saying it. And this connection is so so important. For me, I have to remind myself on a daily basis that I know what’s best for my boys. And if it is questioned, then after fully exploring the rationale for it, then I always reconnect with my instinct. After all it is about doing what’s best for them, and sometimes the answer to that is within us. So at least for me the next time that I feel the need to reach above to my shelf of parenting books, I am going to step back and try to find the inner answer. Maybe yoga, meditation or a walk. And then if after that I still feel the need to consult the written word, then I’ll peruse the book, but knowing that no book has all the answers and that sometimes the best answer lies within. This entry was posted in eagle mom, parenting, Preschool, Uncategorized and tagged children, eagle mom, Early Childhood, Methods and Theories, parenting on April 9, 2014 by Modern Mama. Recently B has hit a remarkable stage. He is all about telling elaborate stories, building things and causing havoc. It occurred to me that there had to be a way to direct his interests into a way to build confidence. so we’ve been taking the interests one at a time. One day he started talking about building a tree-house in the backyard. So, he scouted out the perfect tree. Then, I had him draw a plan for it. The plans weren’t complete until he finished drawing the crocodile slide. Rolled up and secured with rubber bands, the plans became his treasure. 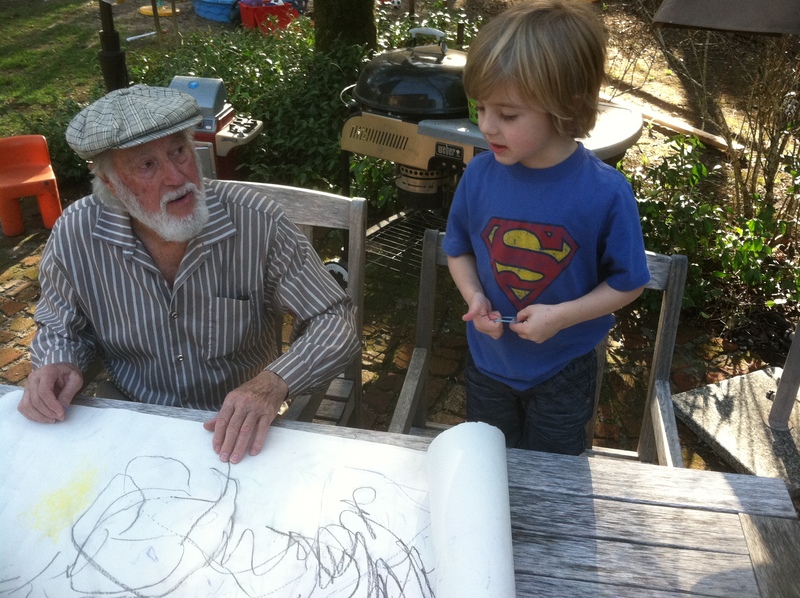 His great uncle came to visit who also happens to be an architect. And, Uncle P was all ears at hearing about B’s concept. His other Great Uncle, a contractor, chimed in as well. This experience just made me think about the positive effects of redirecting the boy energy. Not to mention the importance of mentors. Thank you Uncle P and Uncle T for encouraging B to think big. For me, this was a major experience in letting go. Until now, other than his preschool teachers, either myself of my husband have been teaching him about the world. But we’ve come to a crossroad where it is time to let him gain learning from others. 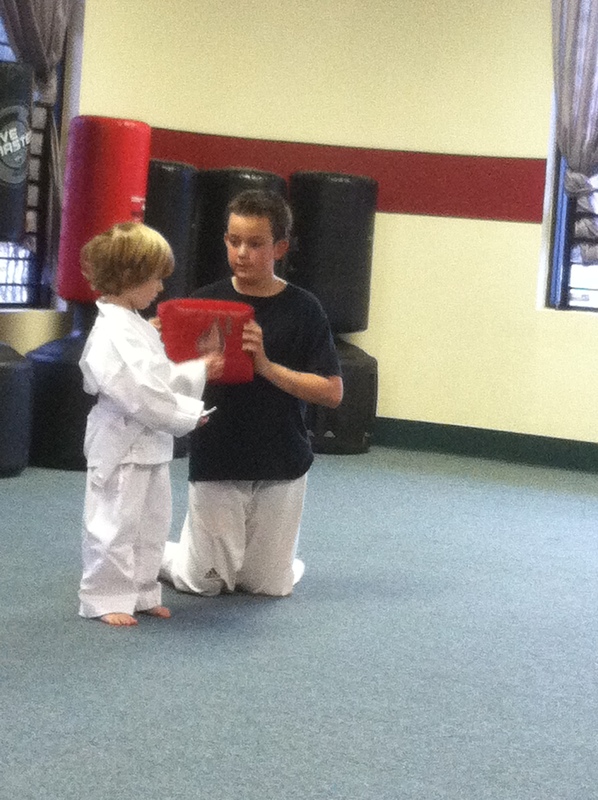 It’s a humbling thing to have your child want to learn something that you don’t know. Hockey – ya right. 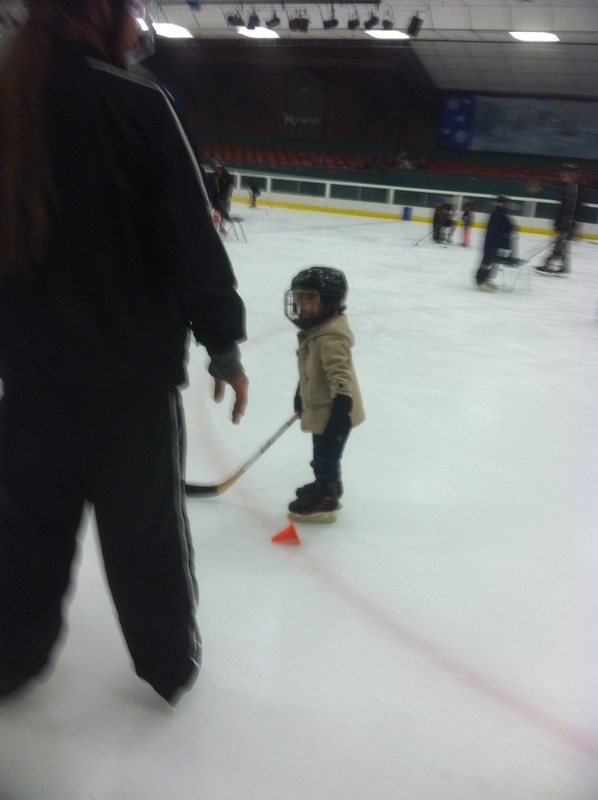 I can hardly skate straight, taekwondo, again another potentially lifelong goal but not at present. Allowing other adult figures to step in to teach things that are beyond me has been eye opening in many ways. Humbling yet empowering, as I know B is growing from his expanded exposure. 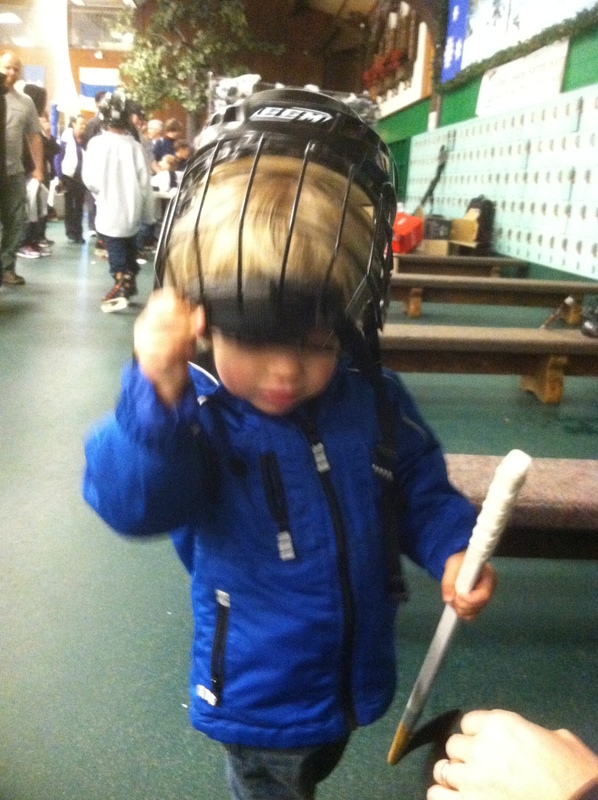 As for redirecting the boy energy into positive experiences, in addition to hockey we’ve tried ninja school. B has been talking about ninja school for months. We visited and watched awhile ago and he has kept talking about it. So, I thought why not let him try. Reluctant at first, he clung close and absorbed the scene. For me it was a parenting dilemma – to push or not to push. After driving a half hour to get there and the days of anticipation, was expecting him to participate asking too much? Clearly he was cautious and unsure about the experience. and, I was getting frustrated at his hesitation. As he sat on my lap, I thought about how comfortable he is in his little nest and the idea of eagle parenting. Encouraging but making the nest a little less comfortable to make young explore outside. But deciding to honor him and his interests, I held back and gently encouraged him. So playfully I made a little earthquake with my legs, which made B stand up. A baby step closer to participating. That coupled with the gentle encouragement by the teacher, made B eventually join the ranks. But he wasn’t sold until he was told to hit hard. Then you should have seen him hit the red bag. Smiling, laughing, not to mention expending all that energy in a positive way. Yay! And he left asking if he could go back tomorrow. Success. So begins a new chapter in parenting and in B’s development. Luckily C is waiting in the pits ready for his turn. This entry was posted in eagle mom, parenting, Uncategorized and tagged children, eagle mom, Early Childhood, parenting on March 3, 2014 by Modern Mama. After literally years of research and trial and error, I have found the right educational fit for my son, Montessori. Before he could walk, I began researching preschool methodologies and consulting professionals about the right fit for him. Montessori v. Waldorf v. Play Based. The debate ensued. (See my earlier post) I looked to find him the “match,” somewhere where he would build his confidence, develop his intellect and be able to enjoy his precious childhood. The consensus was that social and emotional development was important for him and that starting a more structured academic experience had little benefit. So, we started out at very play-based schools. The first school was of more of a Waldorf philosophy which aimed to promote social and emotional development through creative play. B enjoyed it and did well. The director was extremely well versed in early education and child development, and the teachers were engaging, positive and nurturing. The children were well behaved, expressive and welcoming to B. Just when we thought we had it made, a spot opened up at the coveted play based local school. It’s the type of school where the wait list is a binder. We thought long and hard about moving him there. A difficult decision to say the least since he was content. We were ultimately sold on the progression a different teacher and classroom each year for 3 years. We also liked the idea of having B be one of the oldest children in the class – we thought it would teach him to be a leader. With so many of our friends’ children thriving there, it seemed like a safe bet. The decision, however, completely backfired. He regressed from knowing his shapes and colors. He protested going to school. Walking from the car with his head low while dragging his feet. Thinking that consistency might help, we kept him there for a year, hoping that things would change. They didn’t. After the play based approach failed, it was time to try something different. My husband had much success at Montessori. I was reluctant based on the professional opinions I received recommending a play based approach for B and critiques about the method that it could limit creative and imaginative development. Having tried the play based model, it was time for a change. Three of B’s oldest buddies were at the local Montessori. By some miracle, there was a spot for B.
I was reluctant at first to try Montessori based on critiques that it imposed too much rigidity to early childhood at a risk of stifling creative and imaginative development. I can say, however, that while this may be true for some children, it does not ring true for B. Within weeks he started asking to go to school. Now, he tells stories, sings songs and dresses up as whatever he imagines. Clearly his imagination is booming. I have no idea what is going on at his new school, but whatever it is, it is truly magical for B. in a very short time, I noticed changes in B’s ability to express things in a positive way. Out of the blue, he’d tell C or me that he loved us so much, calling the sky or falling leaves beautiful and start to sing songs. He’s more independent – demanding to try things himself first. Yay! Whether this is due to his age or the school, I’ll never know. All I know is that he is blossoming. I am now a Montessori convert and am looking forward to C joining the ranks when he’s old enough to do so. In fact, I’ve again started reading Maria Montessori’s books basically promoting an educational approach to follow the child’s development and build independence. While it didn’t seem a fit years ago, now it is. I’ve begun to try to incorporate many of the ideas into our routine at home, swapping bookshelves cluttered with toys with more targeted and organized choices. Both boys are thriving beyond what I could have imagined a year ago. Don’t take this post the wrong way. I’m not saying Montessori is right for every-child as I believe that no 2 children are the same, they are unique. What works for one child may not for another. All I’m saying is that Montessori works for B. In addition, there are universally applicable concepts like building independence and instilling confidence. Whether a child gets that through Montessori or Play-Based, it doesn’t matter. All that matters is finding a good fit and helping to build the child. 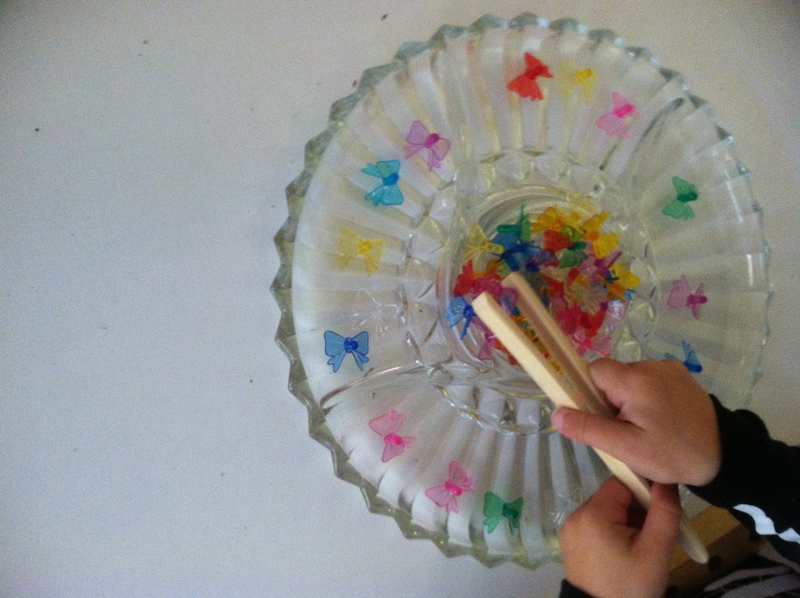 This entry was posted in eagle mom, montessori, musings, parenting, Preschool and tagged Child development, children, Education, Learning Theories, Maria Montessori, Methods and Theories, montessori, Montessori education, Organizations, Thought, Waldorf education on October 22, 2013 by Modern Mama. With two boys, my oldest being 4, I have now figured out the recipe for a fabulously fun birthday bash. It seems there are a few ingredients that are key for the wee ones. First, there’s the theme. For the toddler years, my husband and I picked the themes based on the boys’ interests (trains, brown bear, race cars). 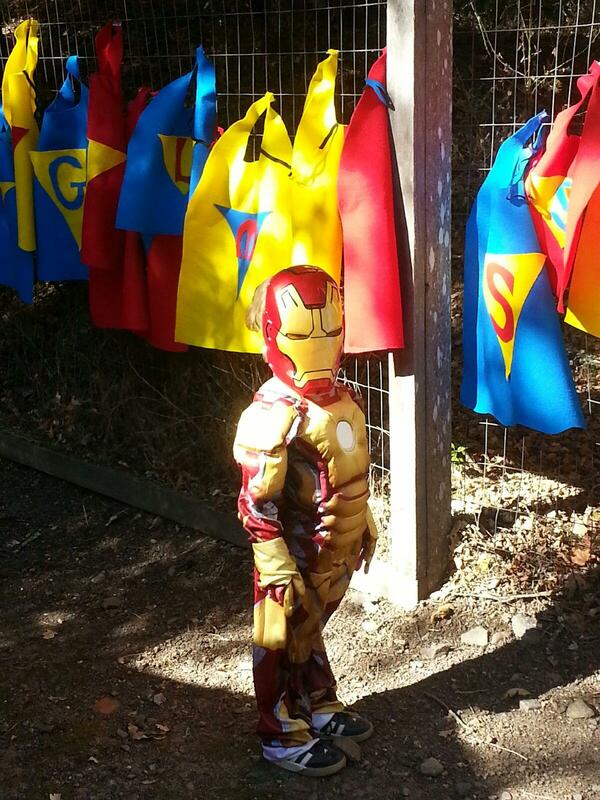 Now, in the preschool years, Bobby is able to pick his theme. This year it was superheros. So, everything from the food to the activities tied back into the theme. Thank you to Tattered and Ink for permission to use her fabulous superhero themed labels! Second, age appropriate activities. For my son’s, third birthday which was pirate themed the kids went on a treasure hunt and dug up ole pirate Davy Jones in the sandbox. For the fourth birthday, I (well truth be told, my husband) turned the backyard into a superhero training area. With balance beams, buildings (i.e. wrapped boxes decorated like buildings) to climb on around the yard, and target practice (water guns and balloons with villains taped on them), there were things for the active kiddos to do. Third, have fun with decorations! A birthday party is an excuse to get creative and to engage the kids. There are tons of ideas online for things to do and easy ways to decorate. The best part is adapting these ideas to your own tastes. For example, for the superhero theme, tons of blogs show the idea of making a skyline. With numerous ways to do it, I decided to do it with supplies I had on hand. Plain brown packaging paper saved the day. The food table had the backdrop of a sky that my boys and I had painted (on the brown paper), signs of words (pop, bang, wham) that were also painted by the boys and Superman suspended by fishing line soared through the sky. And, then the buildings were wrapped boxes that would have just gone to be recycled. 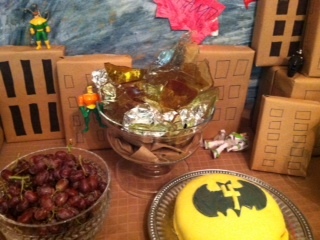 A themed centerpiece works as well. For the pirate party, there was an ocean of jello upon which pirate ships made of rice krispy treats boasting paper sails set sail. The superhero party had sheets of kryptonite made from rock candy surrounded by villains. (Thank you to Sugarhero for the base recipe). Fourth, a simple menu. To make things easier on game day, a simple menu cuts down on prep. For a light lunch, sandwiches, fruit, a couple of salads and a kid friendly snack work well. 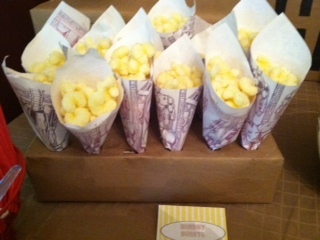 In addition, kid sized snack holders are a hit! Whether it’s a bowl of crackers with tiny dixie cup cups for scooping or paper cones filled with treats, kids love have fun carrying around their own booty. Fifth, a fantabulous dessert. Being a self proclaimed sugar addict , this is one thing that I love to make. 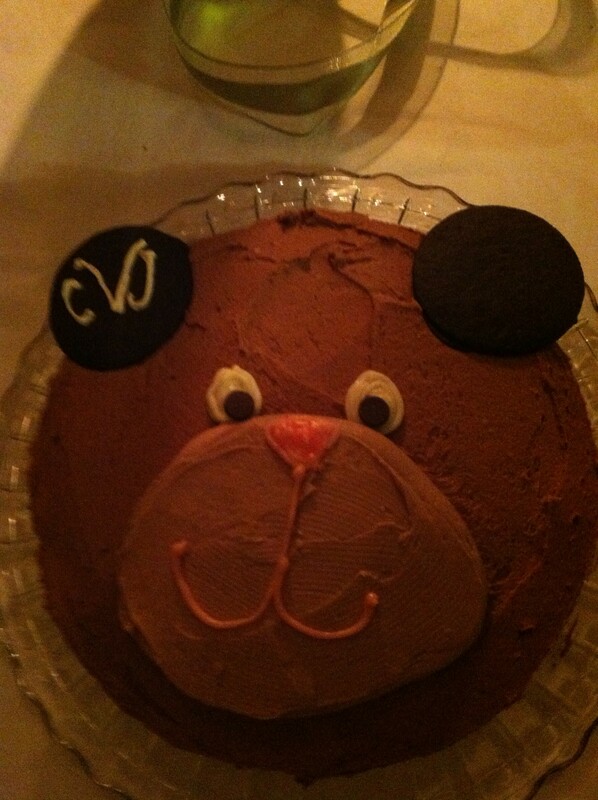 Figuring out how to make a cakes look like a race track, baby bear or batman symbol has been quite the experience. Luckily there are tons of ideas on-line. and, it makes me wonder how our mothers’ did this without the internet. For the batman cake, I ventured into the realm of fondant. Yes, I was a bit apprehensive at first wondering how it would turn out. But at the same time I was completely stoked to have the chance to make something that looked absolutely professional. And, it worked! Here’s the recipe I used. Lastly, flexibility is key. Accept the fact that not everything will go as planned. I could give you story after story of things that didn’t go as planned like a balloon drop that didn’t drop. At the end of the day, these things don’t matter as all that matters is your birthday star has a wonderful day surrounded by those who adore him or her. This entry was posted in Uncategorized and tagged Birthday, children, Davy Jones, Entertaining, Home, Parties, Shopping, Superhero on October 1, 2013 by Modern Mama. For those of you who’ve known me for awhile, you’d think that I’d be the last person to go camping or look forward to doing so. It’s one more example of how kids have changed me. (in a good way). It took awhile for me to muster the courage to camp with the two boys, but all in all it was absolutely worth it and now I’m (and they’re) hooked. 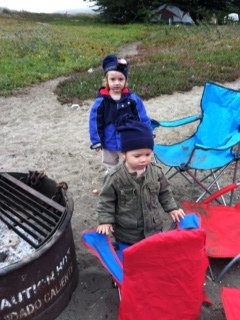 We combined a camping trip with potty-training which was a gamble. Turns out it worked out well. My nearly four year old has been reluctant to potty train. For months we’ve been trying, with “potty treats” displayed on the mantle as motivation including a glass vase full of lollipops. Having tried nearly every trick in the book, it was time for a new approach (and less sugar). Something drastic. It was time to pull out the big guns. Before the trip, my husband and I explained that big boys had to wear underwear camping. Bobby seemed up to the challenge. With tons of extra clothes for him and the potty (and a few back-up pull-ups) we were ready to go. Bobby did extremely well the first day (none). Then the second day was not as successful, which really didn’t matter. The point was the trip represented a change. From then on, Bobby was in big boy pants. So, all in all it seems to have worked. We’re still working on that number two though, and I’m hoping it will come with time. I’d love to hear what worked for you. This entry was posted in parenting, Uncategorized and tagged camp, children, Glow stick, Recreation, S'more, Shopping, Toilet training, United States on September 22, 2013 by Modern Mama. The preschool hunt, for some begins as early as they are pregnant, for others long after the child is born. For me, the thought process began when Bobby was merely weeks old hanging out in a baby carrier. I was shopping for apples at my corner market in Oakland when a fellow mom stopped me. She asked whether baby was on a list for school. A little shocked by the question – I said no. At that point, I was really thinking about buying produce, not about preschool options for my little guy. Since Bobby was not even old enough to hold his head up, I thought it was a little early to start thinking about it. What I learned was that the waiting lists at some schools start as early as when kids are in utero. Yikes, I was already behind the ball! With this in mind, when I moved to Sonoma when Bobby was six months old, I began the hunt. In foreign territory as neither child development nor teaching is my profession, I searched for information. Looking for expert opinions I consulted books and numerous articles (like these 1 and 2) detailing different educational philosophies like Montessori, Waldorf, Emilia. There is only so much you can surmise from a book though. The best advice came from local moms at the playground as they had actual experience with kids at the schools. As I learned that there were different degrees with which the philosophies would be implemented at particular schools. From strict implementation to lax, from focusing on daycare to the preschool program, there were so many things to consider. A shopper by nature, I visited the top schools that I had heard about. Armed with my lengthy list of questions in hand like student to teacher ratio and schedules, I carefully observed what each school had to offer. As I became more educated about programs, my list of questions evolved. What were their goals for their graduates? What approach did they employ? How did the school develop confidence in the child? How did they engage children? Of course, practical considerations like location and schedule came into play as well. As one particular school that I fell in love had a very short program. The short program coupled with the travel time to get there was impossible for my work schedule. The decision involved other things more specific to Bobby like temperament and handling food allergies. In addition, Bobby’s reaction to the school was key. This even required a separate visit for some schools. When Bobby visited, there were some schools where he immediately seemed comfortable. There were other schools where wanted to be held the entire time. Kids – did the kids seem engaged? Teachers – what was their approach to teaching? How did they interact with the kids? How long had they been there? Structure – what schedule did the day follow? Art – what was the school’s approach to art? Was it free form or worksheets? Curriculum – what was the curriculum? Was it play based, Montessori, Waldorf or a hybrid like High-Scope? Environment – was it organized, bright & cheery? Play spaces – how did the space seem? Was it safe, clean, inviting? Approaches to Discipline – what was the approach to discipline? Would kids be in timeout chairs wearing a cone of shame? Or is there another more positive approach? Socialization – how does the school encourage socialization? With so many great options, picking a preschool can seem like such a tough and even overwhelming decision at times. The good news is that there are resources out there to make it easier. Cindy Studdert, owner of FarmTots, put it best when she described her decision not to open a formal school due to the great and numerous child centered programs in town. In Sonoma, the Sonoma Valley Mother’s Club hosts a preschool fair every other year. As a past coordinator of the fair, I can say firsthand that it is a unique and fabulous event. Numerous preschools and other kids’ activities attend to showcase their programs. It is the event where you as the shopper can comparison shop for preschools under one roof. Take your list of questions and go booth to booth! It is a fabulous way to start comparing different schools. This year, the Preschool/Tot Fair is on Saturday, March 16, from 10 – 12 at the Veterans Building. If you’re outside of Sonoma, check your local mothers club to see if they host such an event. If they don’t, maybe start one. Thanks for reading and letting me share my musings with you. I hope this article is helpful. I’d love to know what helped you pick a school? This entry was posted in eagle mom, FarmTots, parenting, Preschool, sonoma and tagged children, eagle mom, emilia, high scope, montessori, parenting, picking preschool, sonoma, tips, waldorf on March 13, 2013 by Modern Mama. Do tidal waves hit your bathroom too? It’s amazing that after bath-time there is always water splashed about my boys’ bathroom. Encouraging fun and water play is important over here. After all, the boys have such a fabulous time fishing for toys, pouring water and playing water instruments. That said, I am starting to need to put some limits around this spash zone. Somewhere between bath-time exploration and the splash zone has to be a middle ground. I am waiting to find it. In search of it, I’ve implemented the following golden rules. We’ll see how long they last. I’d love to hear your ideas too! This entry was posted in eagle mom, parenting, sonoma, Uncategorized and tagged children, parenting on February 9, 2013 by Modern Mama.